Birdy performing at Hollywood Forever Masonic Lodge. At ten after 8 pm, the buzz in the crowd grew louder and louder in Hollywood Forever Cemetery's Masonic Lodge. It was packed with people, wall to wall; the upper mezz saved for special VIP and friends. One could quickly tell this was no ordinary concert. Four hours earlier, a handful of people already started to line up where only a few feet away lay headstones of the long lost. Tonight was special. 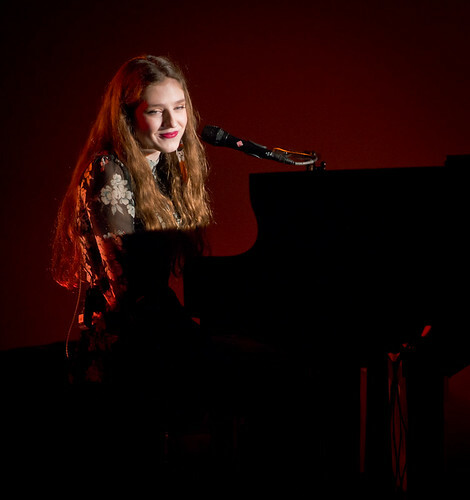 It was Birdy's first Los Angeles show since 2012 when she broke onto the scene as a 15 year-old with the release of her first single - a cover version of Bon Iver's "Skinny Love." That single shot up the charts in the U.K. and the debut album it belonged to shot straight to #1 in Australia, Belgium, France and the Netherlands. At 8:11, like someone turning off a light switch, the crowd quieted as Birdy, real name Jasmine van den Bogaerde, took the stage, a lone spot light centering on her, as she sat on her baby grand piano. Even though Birdy, now 17, is widely successful overseas, U.S. fans are now getting a chance to see and hear her perform live (most for the very first time) with a string of American dates to start the new year in what seems to be a warm up to her bigger North American Tour with Christina Perri starting this April. But this night, Birdy was stripped down, playing an intimate set at Hollywood Forever's Masonic Lodge, a favorite venue for artists wanting to connect closely with the audience. From her the very first keys she played on her piano Birdy captivated the audience for her entire 9-song, 40-minute set that included songs from her debut album as well as her newest Fire Within. 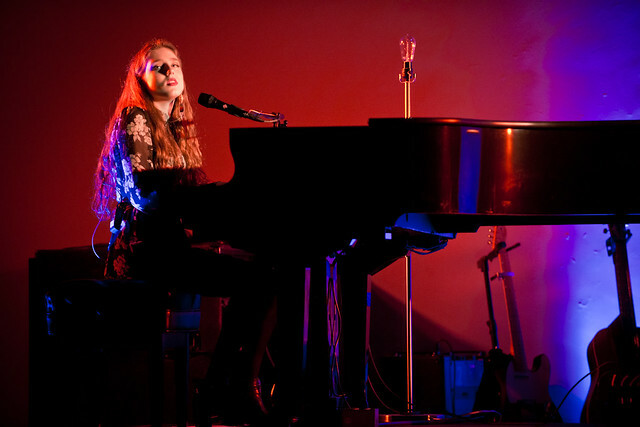 Known for her understated yet powerful arrangements of songs, Birdy started off the night performing songs off her critically acclaimed debut album with "Shelter," "Young Blood" and "People Help The People," all covers that highlight her talents of breaking down songs and building them back up to a more vulnerable and softer versions of the original. 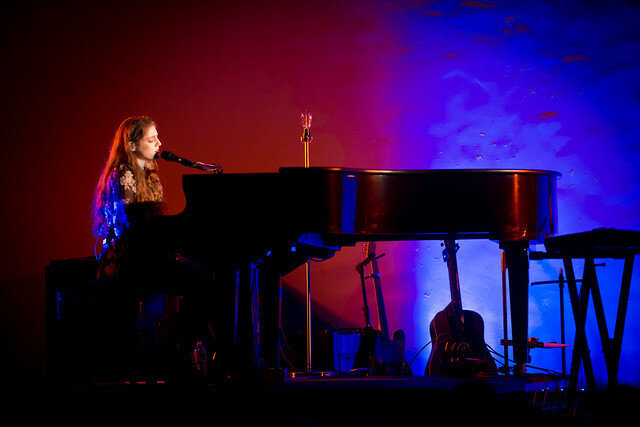 Birdy aka: Jasmine van den Bogaerde's North American tour with Christina Perri begins in April. Although her fragile arrangements of popular songs was what got her noticed, Birdy showcased her talent for writing original songs that are delicate and, in a sense, makes you feel like watching her bare her soul to the entire crowd. Themes of heartbreak and overcoming obstacles are layered throughout Fire Within. In the elegant "Strange Birds," when she sings "Now I want to fly into your world. I want to be heard. My wounded wings still beating. You've always loved the stranger insider," Birdy reveals her maturity and identity as a singer/songwriter. In "Words as Weapons" Birdy, for the first time, took center stage, leaving the comforts of her piano and exchanges it with a guitar, fearlessly showing her emotionally thick skin singing "I feel your knife as it goes right in. Cut to my core but I'm not bleeding." And in her most euphoric song of the night, backed by a lively band that colored the lodge with hearty melodies, Birdy sang "Light Me Up," an uplifting song about finding one's own way through the darkness before ending the night with her first single off her new album "Wings" about reminiscing about the good times in your past and wishing to relive them again. "Wings" has been featured on movie trailers for "Winter's Tale" starring Colin Farrell, Russell Crowe and Jennifer Connelly and for the Kate Winslet and Josh Brolin film "Labor Day." 2014 is shaping up to be a breakout year for Birdy. Her second studio album Fire Within gets its U.S. release sometime this year. She recently got nominated for Best British Female Solo Artist at The BRIT Awards which takes place February 19th at London's O2 Arena and it was recently announced that she will be touring with Christina Perri on her North American tour starting this April.